I love observing nature and the changing seasons during my Norfolk countryside dog walks accompanied by my ever-faithful canine companion Starrydog. I especially enjoy taking photos of Norfolk butterflies, wildflowers and other flora and fauna that I happen across while exploring local nature reserves. Visit my Norfolk nature photo blog to keep up to date with my photographic adventures and enjoy my butterfly photos. December 2013 brought unusally mild winter weather to the UK in terms of temperature, but instead of snow the jet stream lashed us with a dangerous and violently destructive combination of high tides, and strong storm force winds that caused a sea surge on the North Norfolk Coast that was more severe than the infamous North Sea Flood of 1953. Thankfully in the intervening years sea defences were improved and held well. This time though the flood water was higher we had good warning that saved many lives despite wreaking havoc at many of the beaches and coastal reserves. 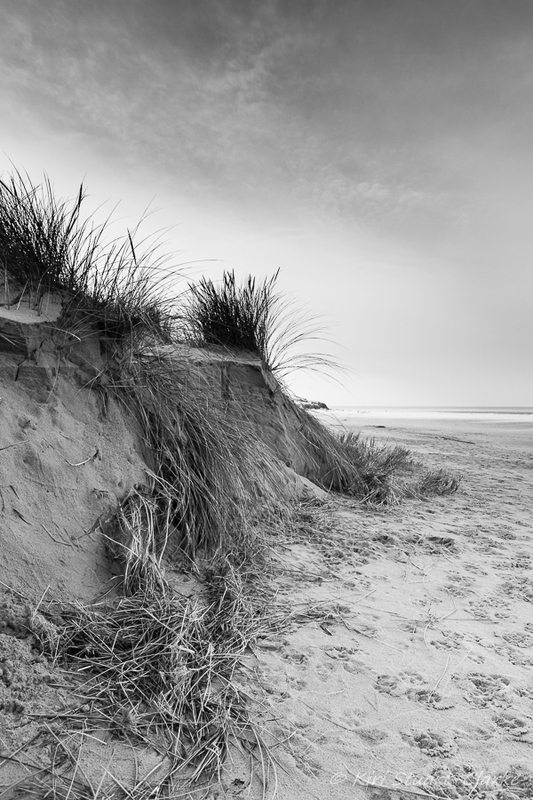 The storm event has dramatically re-shaped the coastal environment, permanently changing the profile of the East Anglian coastline. A visit to Wells beach about a week after the incident brought home to me the full force and elemental power of nature that had been unleashed. The sheer strength of the sea surge breached the two landmark giant dunes as well as sections of the previously dune-sheltered tidal lagoon channel towards Holkham beach, ripping out the wind smoothed sand hills, and the dune grasses that held their forms in place and ploughing thousands of tonnes of sand across the beach plain towards the beach huts and smashing a new vertical sand cliff when it reached the edge of the Corsican pine plantation. Here is a small gallery showing the scale of the changes to the beach profile. The first shot is pre-storm. © Kiri Stuart-Clarke 2008-2017. All Rights Reserved.